Whether you're using it for cooking, cleaning or both, this distilled white vinegar is great to always have on hand! Use this versatile vinegar for a variety of cooking applications in your commercial kitchen. It has a clean, crisp flavor that is ideal for salad dressings and vinaigrettes. With 256 servings per container, you'll be able to use this distilled white vinegar in various recipes, while keeping your restaurant well stocked. White vinegar can be used as a flavoring in your traditional ham and beans entree, in pickling, and even in marinades to tenderize meat. It's a light and healthy way to add flavor to your foods without adding calories or preservatives. 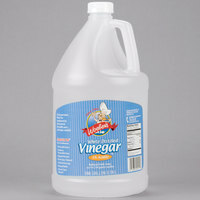 A great gallon jug of distilled white vinegar that is great for pickling, caning, and using in your cooking. The vinegar has a great acidity level. This gets the job done. Unlike some other discounted brands, it's not overly diluted, so you won't need to purchase twice as many bottles. Decent value. Great regular vinegar for cleaning, cooking or whatever you need it for. . Much better price than any competitor. I will be ordering this vinegar for both my work and home. Excellent price and convenient shipping. We use this vinegar as a natural cleaning product on our wood floors and to clean the flat top grill! Does the trick every time! Good'o vinegar, can't go wrong with this item. Great price, great packaging, and always shipped on a timely manner. Will recommend this brand, the flavor is right there! This is a fantastic product. An absolutely amazing price for an all natural certified kosher vinegar. We use it to wash our vegetables and for cleaning products! A good basic white vinegar for cooking or cleaning. Outstanding price that gives you four 1 gallon jugs. If you use vinegar in either bulk or short amounts, this is the best value for you. Great quality and one of the best prices you'll find out there. It's also kosher and gluten free if you run into someone who asks! We are very happy with this product, mostly because of the price. There are so many uses for white vinegar, and this brand offers good quality for very little money. This Distilled White Vinegar is great. We use it on everything. At the prices we will keep this product in our pantry at all times. The deal you get from purchasing the 4 pack case is incredible. It's just plain white vinegar. This vinegar is an excellent way to contribute to your cleaning regimen as well as your food. It's great on greens and is good for use in dressings. always arrive undamaged, and always the same quality and consistency you can expect. Great pricing, great product. perhaps we use too much of this! thanks all! I use this product to make grilled chicken marinade in my cafe. It works excellent! I use quite a lot of it and I love it! It's white Vinegar. The price is great even with Shipping. I am always amazed at the quality of packaging from the site. Never leaks or breaks. Order will confidence. The 4 gallon jugs of distilled vinegar we ordered were smartly and securely packaged in this 4 place cardboard box. They will come in handy to keep our coffee machine clean and running smoothly! Another great item at a great price..Many uses including cleaning your floors and walls at a cheap price.I would purchase this again.I recommend this item. Good quality. Products arrived quickly. Each bottle was individually wrapped to avoid spilling. Price is competitive to local supplier. Would definitely order again in the future. A really great distilled white vinegar that is excellent for pickling and making our brines. The vinegar is sour and the perfect acidity for all our baking needs. This is a fantastic vinegar. I really appreciate that this also has a bar code on it for easy receiving. It's a good cleaner for your store and a good ingredient in cooking. We do a lot of pickling and making of salad dressings. This white vinegar is great quality for these uses and the price point is better than other vendors. This is a great price for white vinegar. I use it everyday for cleaning. I make all my own cleaning agents and this is a main ingredient. The versatility of vinegar is incredible, and with a case of four entire gallons, we can out this purchase to great use. Shipping was cheap too, considering the weight of the package. this big case of vinegar is a steal. the price is super low for how much you get. the vinegar itself seems pretty standard and works well in my recipes so far so i can't complain. it will definitely last a long time. This is great just like the vinegar you get from the store or through our food service provider but at 1/4 of the cost. I will continue to buy this product, even with shipping it is cheaper than going through my food service provider. We use this distilled white vinegar to make a simple solution of this, Dawn and baking soda to clean kitchen counters and walls as well appliance surfaces. Works everytime. Product is exactly what it says it is. The lid stays attached so you wont lose it. Very good product and will be ordering again. So wonderful to have this from Webstaurant and great for washing with! We use this mainly in laundry to take out smells or stains by adding like a half cup to a cup to each laundry wash. It works great! Great price for four gallons of white vinegar!! I use this regularly for canning veggies as well as cleaning stainless steel kitchen appliances. Delivers fast. What a steel...I am so happy with the purchase of this 1 Gallon Distilled White Vinegar - 4/Case. This was a great deal for the price. I use the vinegar on marinates, and food preparation. This is great. Excellent product. Even with shipping, we've replaced our other commercial suppliers because this is so much cheaper! We use it as a cleaner for glass in our store as well as selling it on the shelf, which it works wonders for. Such a great price for the amount of vinegar that they are selling. It comes in for large containers that were sealed at the cap and individually wrapped in plastic. This white vinegar is such a versatile product. I use it for marinades in meat dishes. I also use it to clean the floors of my house. It is a great buy here on Webstaurant. Such a Great price for such a great product. I use this in many recipes at home. I have also used it in some diy cleaning recipes. I use this vinegar for cleaning a wide variety of surfaces. It's great for floors and counters. I of course use it in a lot of my recipes as well! Great quality! A really good product ! For an awesome price can't beat it , I normally order 3 boxes and lasts me one month ! Delivered right to my shop ! This bottle of white vinegar is the best amount for your buck. The taste is true to its acidity and the gallon goes a long way. Vinegar is used a lot in my recipes to add the missing component from the sweet...the savory side. An excellent purchase. We use this vinegar to clean our coffee and espresso maker as well as to wipe down surfaces that need a quick clean. We do a lot of pickling and the case price on the vinegar can't be beat. Makes great crisp pickles and is just as good as name brands. I'm a big vinegar user, not only in the kitchen, but also in our organic herb and lettuce gardens. I thought this was good vinegar, but at this price - it's amazing! If you use a lot of this product, it doesn't get any more convenient than this. Just be aware that this is only 4% acidity. I am very pleased to have purchased a case of this from you! Budget-priced white vinegar like this is a must for my home since it has so many different uses. Using it daily it seems now. W e go through a lot of vinegar and the case price for this item is unbelievable, I have purchased a couple cases and even took a gallon home to use. ABSOLUTE PERFECTION IS ALL I HAVE TO SAY! White Vinegar at its best and the best price you can find too. I am the happiest camper in town today and it's all because of The WEBstaurant Store! 1000 bows to you AND your MOST efficient customer service! I'm a forever customer. See ya soon..
if you havent not seen vinegar for a cheap price, here it is! this is one steal for 4 gallons, wow! Convenient gallon size case quantities are a bargain compared to other bottles from my local supplier. Shipping is reasonable and fast as always, we will be buying this again. This is one of the best item must have in the kitchen. It help to fight grease, and cleaning in general. The price is the best compare to others. This white vinegar is a wonderful item for cleaning and the price can't be beat. Works well for general cleaning mixes, clogs in drains, etc. Excellent product. We used to have a clogged drain every two weeks but since we started pouring a bottle of Admiration White Vinegar into our drain system we haven't had a clog since.